(Nanowerk News) Who among us hasn't wanted to don a shimmering piece of fabric and instantly disappear from sight? Unfortunately, we non-magical folk are bound by the laws of physics, which have a way of preventing such fantastical escapes. 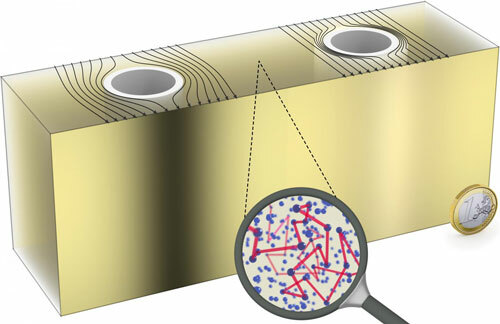 Real-life invisibility cloaks do exist, in a manner of speaking: researchers have engineered systems that bend light around an object, shielding it from detection. But most are very tiny and only work at very small wavelength ranges, rendering them less impressive to the average observer. Now, a group of researchers from the Karlsruhe Institute of Technology (KIT), in Karlsruhe, Germany, has developed a portable invisibility cloak that can be taken into classrooms and used for demonstrations. It can't hide a human, but it can make small objects disappear from sight without specialized equipment. Scientists hoping to divert light around an object to render it invisible must find a way to compensate for the increased distance the light must now travel. On a road trip, you might solve this problem by changing your speed. If you had planned to take the rutted scenic road directly over the mountain pass, but it's closed for the season, you could instead take the six-lane superhighway that goes around the mountain. The greater distance is offset by the higher speed limit. Unfortunately, light is a bit more challenging than a station wagon. Because relativity prevents mass from traveling faster than the vacuum speed of light, there's no way to further speed up the detoured light in a vacuum or in air. To address this challenge, the KIT team constructed their cloak from a light-scattering material. By scattering light, the material slows down the effective propagation speed of the light waves through the medium. Then the light can be sped up again to make up for the longer path length around the hidden object. In this cloak, the object to be concealed is placed inside a hollow metal cylinder coated with acrylic paint, which diffusely reflects light. The tube is embedded within a block of polydimethylsiloxane, a commonly used organic polymer, doped with titanium dioxide nanoparticles that make it scatter light. "Our cloak takes advantage of the much lower effective propagation speed in light-scattering media," said Robert Schittny, who led the research project. "As we seemingly slow down the light everywhere, speeding it up again in the cloak to make up for the longer path around the core is not a problem." If the average time it takes light to travel through the polydimethylsiloxane block is in just the right proportion to the average time it takes to travel through the cloak, the core will become invisible. On the other hand, the completely solid-state cloak can be easily transported to classrooms. "It is a macroscopic cloak that you can look at with your bare eyes and hold in your hands," said Schittny. "With a reasonably strong flashlight in a not too bright room, it is very easy to demonstrate the cloaking. That means no fancy lab equipment, no microscopes, no post-processing of measurement data. The effect is just there for everyone to see." Schittny and his colleagues hope their cloak will be used in classrooms and labs to excite and educate students about physics. The presentation, "All-Solid-State Invisibility Cloak for Diffuse Light," by Robert Schittny, Andreas Niemeyer, Muamer Kadic, Tiemo Bückmann, Andreas Naber, Martin Wegener, will take place from 15:30 - 17:30, Tuesday, 13 May 2015, in the Executive Ballroom 210C, San Jose Convention Center, San Jose, California, USA.